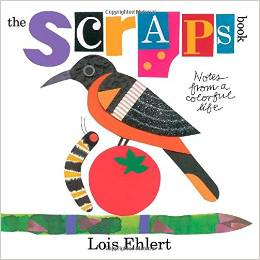 The Scraps Book—Notes from a Colorful Life by Lois Ehlert. Beach lane books (Imprint of Simon & Shuster), New York, NY 2014. In 2013 I had the privilege of meeting Lois Ehlert at the Sheboygan Children’s Book Festival. I had brought along my copy of Hands(Harcout Brace1997), for her to sign. I had purchased it at an annual SCBWI Wisconsin retreat several years previous, probably right after the book was released. Lois was pleasantly surprised when she was presented with this particular copy to sign, because, she said, “You must have gotten that a long time ago.” She went on to explain that because the book was shaped like a work glove, it was difficult for libraries to shelve. I have since done a search for Hands and discovered a different copy with the same name but a more standard cover was released in 2004. I also found a copy of the original, work-glove shaped copy in my library system. It came to me intact, except for the dog-eared fingers. I’ve also discovered that the copy I have, signed by Lois, is probably quite rare. I won’t, however, be selling it on EBay anytime soon! Hands portrayed how Lois was influenced by her parents to become an artist. It is from the point of view of a young child. The Scraps Book is even more autobiographical as it is from the point of view of the adult artist. That is not to say that Scraps won’t appeal to children. With its vibrant colors of scraps of fabric, buttons and flowers, a child could easily spend much time pouring over a single page of this gem. What both Hands and The Scraps Book portray in loving prose and picture is the important role Ehlert’s parents played in her development as an artist. Early on her father let her help him in his basement workshop and gave Lois her own “spot”: a wooden folding table. He taught her how to “…paint, saw, and pound nails.” Her mother introduced her to sewing with the many “…colorful fabric scraps, buttons, lace, ribbons, and many scissors…” To this day she uses her mother’s pinking shears. Both of these books will be cherished. More like journals than books, both are written with love and remembrance of those parents who gave Lois the support she needed to become the accomplished artist she is today. Any child who loves working with his or her hands is bound to love these books into a similar dog-eared state, like that of the library copy I found. I really enjoyed this post, Stephanie. It made me want to run right out and buy both books. A bit cold here in Madison to do that today, but I am adding it to my “To Buy” list for my next bookshop visit and look forward to sharing them with my grandchildren. Thank you!